U.S. military Tuesday revealed it deployed gunships to deal precise blows to the Islamic State (IS) militant position in Sirte. 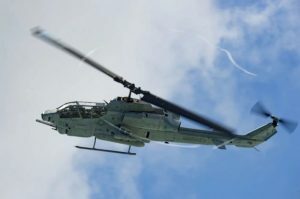 The U.S. African Command providing help to Misrata forces fighting under the banner of Libya’s Government of National Accord (GNA) indicated that they have, over the weekend, flown Marine Corps AH-1W SuperCobra attack helicopters over Sirte; IS last stronghold in the North African country. Some Marine Corps AH-1W SuperCobra gunships were used between Friday and Sunday to destroy 25 enemy fighting positions and two supply trucks, Libyan Express reports. Battle gunships were launched from the USS Wasp, an amphibious assault ship in the Mediterranean. The U.S. has joined the campaign against IS since August 1. More than 70 airstrikes have been launched against IS by unmanned aircrafts and Marine Corps AV-8B Harriers since the start of the U.S. Operation Odyssey Lighting campaign. The U.S. Defense department said that it entered the campaign at the request of the GNA and that the campaign will take months. The Washington Post citing US official sources earlier this month revealed that US ground commandos are present in Libya, assisting Misrata military operation rooms set up by the GNA. Written by: Jaber Ali on August 24, 2016. Posted by Jaber Ali on Aug 24 2016. Filed under Headlines, World News. You can follow any responses to this entry through the RSS 2.0. Both comments and pings are currently closed.